A Shakespeare original comes to life in the Department of Theatre’s The Tempest. The exciting plot and meaningful themes will make it worth your money, but the strong female leads will make worth your attention. Prospera, a magician and rightful Duke of Milan, has been stranded on an island for twelve years. She only has herself, her daughter Miranda, a spirit named Ariel and a deformed monster named Caliban. But Prospera knows that her brother Antonio – the one who deposed her in the first place – is near the island. So she causes a magical storm (the titular tempest) to shipwreck him and his crewmates on the island. This sets in motion a plot full of revenge and conspiracies, yet still including some reconciliation. The way this play is put on in Miller Theater is slightly different from how you might be used to seeing other plays. The set is moved only once, and that is after the very first scene. For the rest of the time, it stays completely still and the characters come in and out. This gives the whole performance a very contained feel, which really works for the story. Even though there are presumably different terrains on this island, the set helps to not overwhelm the audience with the different places. This performance also has a plethora of talented actors and actresses. Senior Kelley Hertzler plays the lead character of Prospera. She carries the most emotional weight in the story and has the clearest character arc. Hertzler brings Prospera to life in an intimidating way, but she also shows her softer side. Junior Abbie Jean Litman plays Caliban, a monster who is the slave of Prospera. Her role requires her to play a character who crawls on the ground and acts less than human much of the time and she pulls it off convincingly. But sophomore Ellen Diehl quietly steals the show with her performance as the spirit Ariel. She is a secondary character, but her mannerisms and range of skills – athleticism, singing and dancing – create a stand out performance. The cast is also largely gender-swapped. As it is originally written, most of the characters in The Tempest are men. But in this particular performance, many of those roles are played by women. For someone who is unfamiliar with it going in, it will not seem unnatural at all, and for someone who is familiar with the play, it will come as an interesting and well-done reimagining. There are two prominent themes in this play: love and reconciliation. Prince Ferdinand of Naples is one of the shipwrecked, and he stumbles upon Prospera and her daughter Miranda. Ferdinand and Miranda immediately begin to take to each other and fall in love. Prospera allows the two of them to move towards marriage, as long as Ferdinand works for her, thus exploring what tasks are worth it for love. Meanwhile, Prospera encounters the people who put her in her predicament and has to decide how to respond. This explores the importance of forgiveness and understanding. The Tempest is another job well done from the Department of Theatre. The wonderful cast, impressive staging and important themes make it a worthwhile experience. 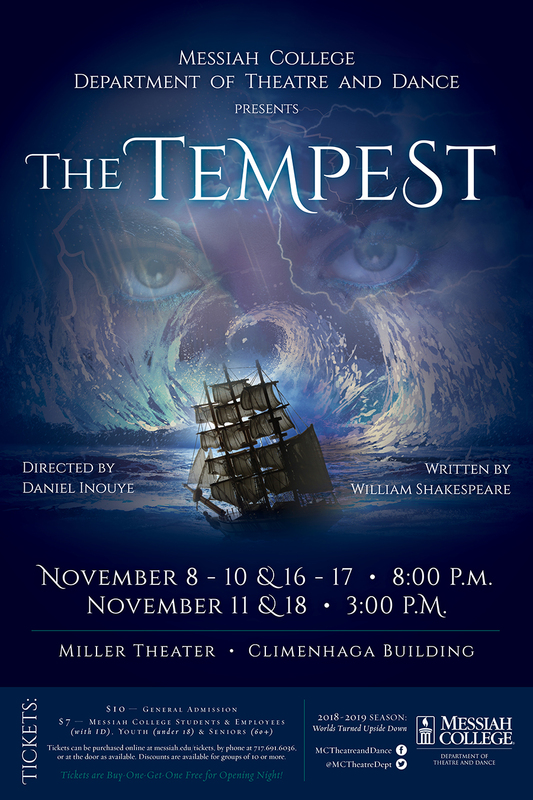 The Tempest will be showing November 16-17 at 8 p.m. and the 18th at 3 p.m. in Miller Theater. It is $10 for general admission and $7 for Messiah students and employees, youth and seniors. Tickets can be purchased online at messiah.edu/tickets, by calling 717-691-6036 or at the ticket office window.